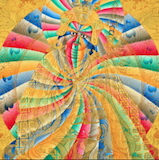 A lot of Tibetan versions of mantras have several alterations to them. Sometimes they are very obvious, such as Hum into Hung, Phat into Phet or Pey, and sometimes less obvious, such as transforming Ja into Dza. I am trying to figure out some others, and eventually make a list of this. First question on my mind is Cha into Tsa. Tsa is actually quite common in a few Tibetan mantras. Phonetic schemes in English (or European languages) to help those who cannot read Tibetan vary widely, hence Hung or Hum or Huṃ, use of accents etc. in order to approximate proper pronunciation. The reason many of these "alterations" happen, FWIW, is that Tibetans follow their own pronunciation rules when pronouncing Sanskrit, quite often. A good example is "Pema" in Tibetan, for "padma" in Sanskrit. The "d" character in Tibetan is silent, in this case, and it lengthens the short "A" into a long "A." Last edited by dzogchungpa on Tue Feb 11, 2014 7:25 pm, edited 1 time in total. This thread addresses your question. . .
conebeckham wrote: The reason many of these "alterations" happen, FWIW, is that Tibetans follow their own pronunciation rules when pronouncing Sanskrit, quite often. A good example is "Pema" in Tibetan, for "padma" in Sanskrit. The "d" character in Tibetan is silent, in this case, and it lengthens the short "A" into a long "A." Also in terms of the way they are spoken (or recited), sometimes the difference can also lay in where the particular Lama is from as Different parts of Tibet have different dialects or even different ways of pronouncing syllables. Pei/Phat is a good example of this. There are several ways that this is pronouncded. For recitation of mantra's forexample, I think the best way is to recite the way that it has been transmitted to you. Terma, I think that's the common Tibetan view, just go with your teacher's rendition of the mantra. But at the same time, you can find a few high level Tibetan teachers (I won't name names) who said it directly that Tibetan is not a sacred language, Sanskrit is. And that is correct. Therefore, the practice of altering Sanskrit for local pronunciation is wrong and has led, in the case of some more widely used mantras, to huge alterations over time, which leads me to question to effect of the mantra's sound-form in the greatly modified version. One of the funniest examples of this is the Sanskrit alphabet mantra, which has also been altered for Tibetan script. That sort of had me laughing, but at the same time, it's very very sad. Also, there are actually stories of founding Tibetan teachers receiving mantras wrongly pronounced and then managing to get correct Sanskrit transmission. So in that sense, there's a precedent at the very root of their tradition for keeping Sanskrit pure. witness modern Bengali's "bozro" (phonetic spelling) for the same word. >I think the best way to pronounce it is the way your lama wants you to. >books, please find a lama to instruct you. deity is so stupid that they don't understand our intention? performance of the fire puja at the end of a recitation retreat. than softening a dental, or strengthing a labial. elaborate and mechanical form of egoism. Mantra is intentionality. be much of an obstacle. This takes the anthropological view of Sanskrit and its pronounciation, and then goes on to take a pure view of mantra as perfect sound. Is mantra the perfect fundamental sound of the Buddha or is it localized in time and space? Second, it takes a sangha view of mantra practice, but there is also the dharma and Buddha view. As explained in Maitreya's Uttaratantra Shastra, sangha and dharma originate from Buddha, and are never separate from its nature, so taking a sangha relational view of mantra as separate from its ultimate and original nature can, and does result in altering its sound and making it anthropocentric. Also, the tantric practice view expressed there is, let's say, not complete? It's the view that mantra works externally through deity. Even accepting that view, which is not highest yoga, what about mantras and dharanis that can be found in sutra, and are numerous. Those would fall under the category of "getting your mantras from books, which is useless". Finally, if you take the view of Buddha nature unfolding through an array of enlightened beings which are its interplay, a merit field that you interact with through tantra, the sound of which is mantra, primordial sanskrit unfolding throughout countless universes, then why then make the view of Sanskrit pronounciation being localized in the time and space of a certain Indian region.